Objectives To determine the incidence of intrauterine fluid in patients with ectopic pregnancy and to define the characteristics that distinguish this fluid from an early intrauterine gestational sac. Methods We identified all patients scanned transvaginally at our institution from July 2008 through August 2011 for suspected ectopic pregnancy, who proved to have ectopic pregnancy based on pathologic, surgical, or adnexal sonographic findings. We reviewed the sonograms to characterize any fluid in the uterus as to shape, contents, and location. Fluid was classified as type A if it was pointy edged, contained echoes, and/or was clearly located within the uterine cavity or type B if it was smooth walled and anechoic and location was in the decidua or uncertain. The appearance of type A fluid is inconsistent with a gestational sac, while the appearance of type B overlaps that of a gestational sac. Results Our study population included 229 women with ectopic pregnancy. In 38 (16.6%), sonography showed fluid in the uterus, which was classified as type A in 31 and type B in 7. Only 2 patients (0.9%) had type B fluid with no adnexal findings suggestive of ectopic pregnancy. Based on these results and the published incidence of ectopic pregnancy (2% of all pregnancies), we calculated that a patient with a positive pregnancy test, an intrauterine smooth-walled anechoic cystic structure, and no adnexal mass has a 0.02% probability of ectopic pregnancy, while the probability of intrauterine pregnancy in such a patient is 99.98%. Conclusions Fluid can be seen in the uterus in 16.6% of patients with ectopic pregnancy. On transvaginal sonography, it can be distinguished from an early intrauterine gestational sac based on shape, contents, and/or location in most cases. In the remaining cases, the fluid appears indistinguishable from, and is highly likely to represent, an early intrauterine gestation. o Received April 17, 2012.
o Revision received July 20, 2012. Objectives The purpose of this study was to investigate the feasibility of using quantitative shear wave elastography for assessing the functional integrity of the Achilles tendon and to summarize the changes in elasticity of ruptured Achilles tendons in comparison with normal controls. Methods Thirty-six normal and 14 ruptured Achilles tendons were examined with shear wave elastography coupled with a linear array transducer (4–15 MHz). The elasticity value of each Achilles tendon in a longitudinal view was measured. Results The mean elasticity value ± SD for the normal Achilles tendons was 291.91 ± 4.38 kPa (note that there are saturated measurement phenomena for the normal Achilles tendon, so the actual value will be >300 kPa), whereas the ruptured Achilles tendons had an elasticity value of 56.48 ± 68.59 kPa. A statistically significant difference was found in relation to the findings in healthy volunteers (P = .006). Conclusions Our results suggest that shear wave elastography is a valuable tool that can provide complementary biomechanical information for evaluating the function of the Achilles tendon. o Received June 4, 2012.
o Revision received June 25, 2012.
o Accepted July 25, 2012. 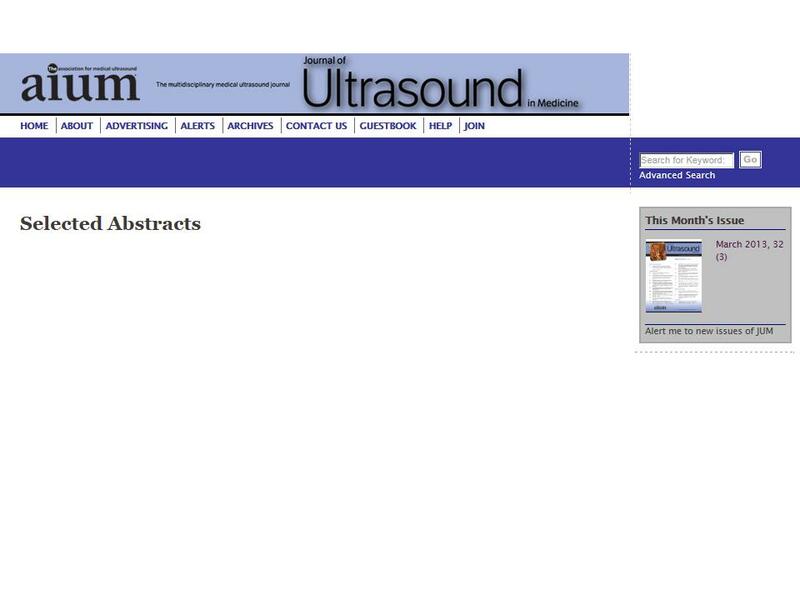 Objectives The purpose of our study was to investigate interobserver agreement for thyroid ultrasound elastography and to analyze the reproducibility of real-time freehand elastography in thyroid nodules. Methods A prospective nonrandomized double-blind study was conducted between September 2008 and June 2010. Real-time elastography of 89 thyroid nodules was performed by two radiologists, with the first radiologist evaluating each thyroid nodule 5 minutes before the second. The elastograms were obtained with the patients holding their breath and considered valid when the quality factor was 50 or higher. The region of interest was positioned to include the nodule and 0.5 cm of surrounding normal thyroid parenchyma but to exclude the carotids and esophageal-tracheal structures. The elastograms were classified on a scale of 5 different patterns. Results Observers 1 and 2 coincided in 79 elastographic patterns and disagreed on 10 nodules (11.2%). The results between the radiologists had a statistically significant agreement (P < .005), with a κ value of 0.838. Conclusions The introduction of a quality factor in elastographic software and the selection of elastograms with a quality factor of 50 or higher confer almost perfect interobserver agreement for thyroid nodule elastography and make elastography a reproducible technique that could be used in daily clinical practice. o Received May 3, 2012.
o Revision received May 23, 2012.
o Accepted August 3, 2012. Objectives To describe the sonographic characteristics of subacute granulomatous (De Quervain) thyroiditis. Methods We retrospectively identified all patients at our institution during the last 11 years who had thyroid sonography with findings suggestive of subacute granulomatous thyroiditis. We then reviewed clinical data and laboratory results to establish the clinical diagnosis. A final diagnosis of subacute granulomatous thyroiditis was made on the basis of clinical symptoms, suppressed thyrotropin, an elevated erythrocyte sedimentation rate, and/or reduced or absent radionuclide uptake while hyperthyroid. Results Our study population consisted of 35 patients. Twenty-seven patients (79.4%) met clinical criteria for subacute thyroiditis. Symptoms included neck pain in 26 of 27 patients with subacute thyroiditis. The erythrocyte sedimentation rate ranged from 22 to 101 mm/h. In 21 cases (77.8%), sonography revealed focal, poorly defined, nonovoid areas of decreased echogenicity. Findings were bilateral in 16 patients and unilateral in 5. In the remaining 6, the gland or an entire lobe was diffusely heterogeneous. Color Doppler interrogation was performed in 20 patients. Flow was decreased to the sonographically abnormal areas in 19 (95%) and slightly increased in 1 patient. In all 9 patients who underwent radionuclide scanning, focal defects or large areas of decreased or absent uptake were found during the time of suppressed thyrotropin. Enlarged lymph nodes were noted in 16 patients (59.3%). Conclusions The positive predictive value of sonography for diagnosing subacute granulomatous thyroiditis is 79.4%. The most common sonographic appearance is poorly defined regions of decreased echogenicity with decreased vascularity in the affected areas. o Received May 21, 2012.
o Revision received June 18, 2012.
o Accepted July 24, 2012. 5/ Do Radiologists Agree on Findings in Radiographer-Acquired Sonographic Examinations? Objectives Sonographic examinations are usually regarded as observer dependent, but a recently introduced method using documentation with cine loops acquired in a standardized way attempts to address this problem. The aim of this study was to evaluate the intraobserver and interobserver agreement of sonographic liver examinations using strictly standardized examination protocols with cine loop documentation. Methods Ninety-eight outpatients were examined by a radiographer using the standardized method. Three radiologists, each with 10 to 20 years of experience in sonography, reviewed the cine loops retrospectively. After 4 weeks, the review was repeated; the 3 radiologists were blinded to the initial reading. The κ coefficient was used to analyze intraobserver and interobserver agreement, and agreement in percent was also calculated. Results The intraobserver agreement was highest for concrements in the gallbladder (κ= 0.91–0.96) and lowest when assessing the need for further examination (κ = 0.38–0.64). For increased liver echogenicity, κ varied between 0.73 and 0.92 and for skip areas between 0.73 and 0.90. The interobserver agreement was also highest for concrements in the gallbladder (κ = 0.84–1.00) and lowest for the need for further examination (κ = −0.12–0.46). For most other findings, substantial intraobserver agreement was found. Conclusions For sonographic examinations performed according to a standardized examination protocol by a radiographer and viewed by an experienced radiologist, good interobserver agreement was found, except for judgments of the need for further examinations. o Received May 9, 2012.
o Revision received June 4, 2012.
o Accepted August 10, 2012.